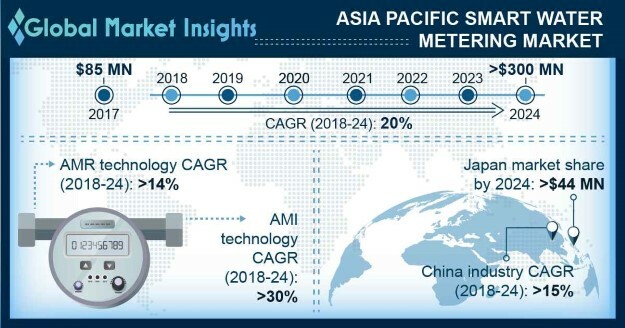 APAC Smart Water Metering Market size will exceed USD 300 Million by 2024, as reported in the latest study by Global Market Insights, Inc.
Invariable need to limit consumptions levels, dictated by a host of national policies concerning sustainable water utilization will drive the APAC smart water metering market size. Respective government authorities across the region are adopting fundamental restructuring of the supply system to ensure accurate meter reading and consumer billing. Shifting trends to limit non-revenue water loss, growing need for accurate billing and retrofitting of aging infrastructure will boost the product demand. Japan smart water metering market is set to surpass USD 44 million by 2024. Favorable government regulations toward the adoption of efficient smart metering devices and maintenance of effective supply will positively influence the business growth. The Measurement Act maintains the accuracy and reliability of water meters by laid standards and provisions for accuracy requirements and time frame for replacement of existing meters. AMI smart water metering market will grow over 30% by 2024. Ongoing technological advancement toward the development of accurate metering technologies will augment the industry landscape. In addition, increasing adoption of smart technologies across utilities to reduce the water shortage and ensure effective billing will enhance the business outlook. Low-cost along with its capability to provide real-time consumption information to the utilities will foster the APAC smart water metering market. These systems effectively perform automatic collection & diagnosis of consumption data from metering devices and transfers that to a central database for one-way communication and billing. Recognizing the utility needs concerning NRW monitoring, accurate billing and leakage detection, the AMR systems are considered as a prominent solution across the sector. Active implementation of smart technology solutions for streamlined operations along with strong private sector investments will foster the Malaysia smart water metering market growth. Utilities are facing huge NRW losses owing to aging infrastructure and leakages in the distribution network. As per the Ministry of Energy, Green Technology & Water, in 2015, the Non-Revenue Water accounted for over 31%. Adoption of efficient metering technologies on account of technological advancement with an aim to ensure effective distribution channel will drive the Australia smart water metering market. The region has witnessed number of projects and significant investments for adoption of advanced metering solutions. In March 2018 the regional authority, Coliban Water has initiated a six year roll out of smart meters to commercial and residential consumers. Key industry players operating across the APAC smart water metering market comprises of Itron, Landis+GYR, Schneider Electric, Siemens, Badger Meter, Arad Group, Neptune, Sensus, Honeywell, Kamstrup, and Diehl Metering.